The first human liver transplant was performed in 1963 by Dr. Thomas Starzl. This operation failed, as did the subsequent seven done throughout the world. In 1967 Starzl performed the first successful liver transplant. 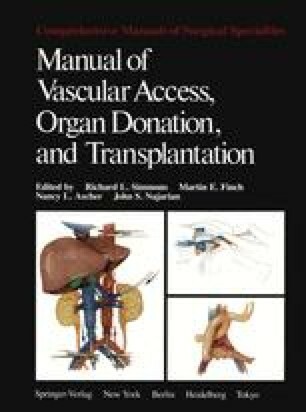 Since then more than 450 transplants have been performed—most by Starzl and his colleagues but increasingly by other groups as well.2 Calne of Cambridge has the world’s second largest series.3 Other major European centers include Hanover (> 60 transplants) and Groningen (> 25 transplants). In the United States, the Universities of Pittsburgh, Minnesota, and Tennessee are current liver transplant centers.